Sausage, Lentils and Brown Rice, hearty winter stew from Thyme for Cooking. Almost a one-dish dinner, the rice and lentils are cooked together in a sofrito of garlic, onion, pepper, celery and carrot. Add as much or as little chili powder as you like and/or finish with a dash of hot sauce. Both the lentils and the brown rice I use cook in 20 minutes. If you use traditional, long-cooking brown rice, partially pre-cook it before adding. Or substitute Basmati. Heat oil in large saucepan over medium-high heat. Add chili powder and sauté 1 minute. Add onion, garlic and sauté 5 minutes. Chop celery, green pepper and carrot, add to skillet and sauté 5 minutes longer. Pick over lentils in case they missed the odd stone. Add stock, rice, lentils and oregano to pan and bring to a boil. Cover, reduce heat and simmer for 20 minutes or until done. Stir occasionally. In a nonstick skillet, sauté sausages until well-browned and cooked through. Cover and remove from heat until needed. Check rice/lentils by tasting. Are they done? If not do they need more liquid? If they are, do they need to be drained (they shouldn't). There should be a bit of liquid left, if not add a tbs or 2 of water. 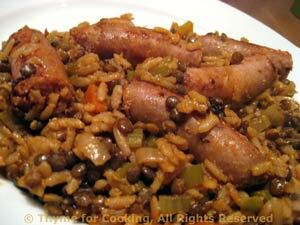 Cut sausages into 3 or 4 pieces each and add to rice/lentils. Heat through and serve.